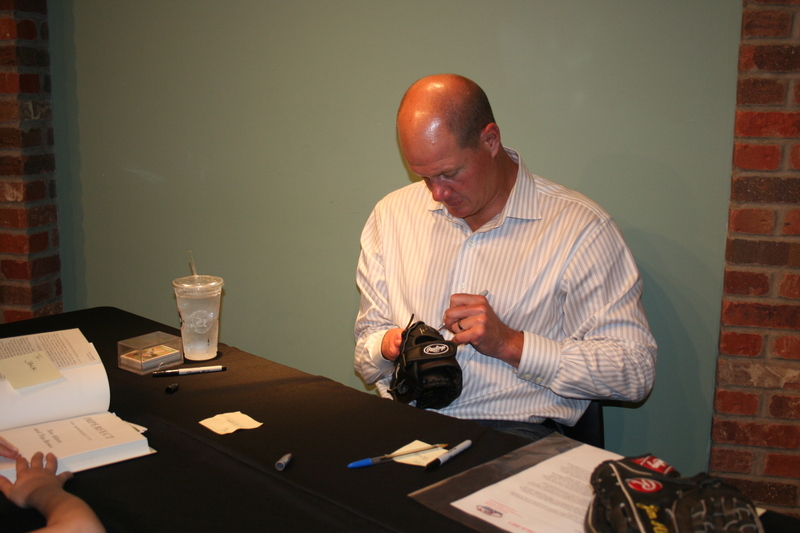 As noted in my Instagram post, we got to meet Jim Abbott last week. I have mentioned him before in this post about Jack and his hand and I’ve talked about Jack’s hand other times. If you haven’t read those posts, it might be helpful as a frame of reference. 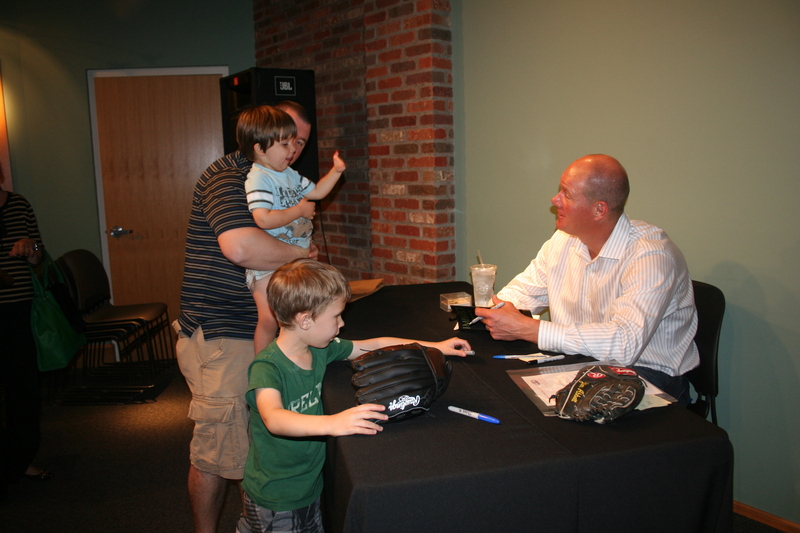 We heard about Jim Abbott’s book (Imperfect: An Improbable Life) and that he was going to be at our local bookstore via the Lucky Fin Project (go like them on Facebook, I’ll wait) and I knew we needed to go – despite the fact that the event started at bedtime. How many planned chances will we have to introduce Jack to someone like him with a limb difference, but especially someone who has had so much success (as State fans, we’ll forgive the playing for Michigan in favor of celebrating the 1993 no-hitter for the Yankees). It was also a big treat for Liam to meet Jim, as he is starting to understand what Jack’s little hand means along with starting to champion his brother. If ever I point out something regarding Jack’s hand, Liam will say (without skipping a beat), “I like Jack’s little hand.” But if ever he doubts his brother, we can remind him of the cool baseball player he met who has a hand like Jack’s. While we were waiting, we met another couple who has an 11-week old little boy whose hand looks just like Jack’s. We got to tell them about the Lucky Fin Project and I gave them my contact information in case they ever wanted to talk about what it is like having a child with a limb difference (spoiler alert: it’s no different than having any other child – you have worries, you hope people like them and they get into all sorts of trouble). That in itself was such a gift, just to know that I could offer some consolation or peace of mind to someone else in the same position as me. Jim could not have been more genuine and just truly nice. Nice is often an under-appreciated word but there is no better word to describe him, he spent time talking to Jack and telling all of us that nothing would hold him back (which we know full well). He looked me in the eyes while he was speaking with us and you could see that he gets what it means to parent someone like himself. I would love to talk with his mother and get some pointers. Because while nothing will hold Jack back, it’s still my job (and Simon’s) to make sure he believes that and approaches life with confidence and courage. And just because nothing should hold him back, it doesn’t mean that no one will try to hold him back, thinking that his lack of a fully-developed hand means he can’t do X or Y. It simply means he’ll have to do some things differently, sometimes working harder and having to prove himself a little bit more than others. Jim noted that his second grade teacher taught him how to tie his shoes – figuring out a way to do it with just one hand – and this is the way he still ties his shoes to this day. I pray for people like that in Jack’s life, people who will help him navigate the difficulties and teach him important lessons. Jim also mentioned in his book that classrooms were often where he felt most awkward or conspicuous because those were the places where the most questions would come up. And as he mentions in the video below, his parents taught him just to introduce himself and not hold back, to not be shy simply because of the hand he was dealt (pun intended). Below is a video from CBS Sunday Morning on Jim’s life and career (and hand). Please watch it – but warning, like me, you might cry – especially at the end but it is so worth watching, unless you have no interest in being inspired. I watch that and I can’t help but think about how his mother must have felt when he pitched the no-hitter, not because he doesn’t have a right hand but because every mother wants one of those amazing moments for their child – I want one for Liam as much as I want one for Jack. A moment where there is no place in the world you’d rather be and everyone is cheering you on. Not having a right hand certainly makes the moment sweeter, but as Jim notes in the interview, he didn’t think at all about his hand that day, it was about baseball, being a part of the Yankees and living his dream. If I doubt that Jack will pitch a no-hitter, it has nothing to do with his hand or thinking that it isn’t possible but more to do with the fact that he’s more likely to play soccer or rugby because those are sports that Simon is into. 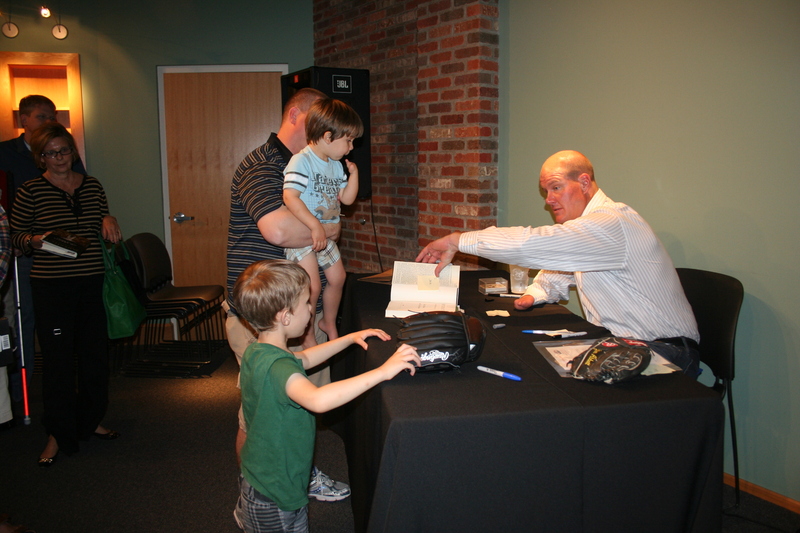 If he does take an interest in baseball, I know that the possibilities are endless – Jim Abbott proves that and Jack would have an amazing person to look up to. A perfectly imperfect person just like him who he got a chance to meet (despite whether or not he remembers it). 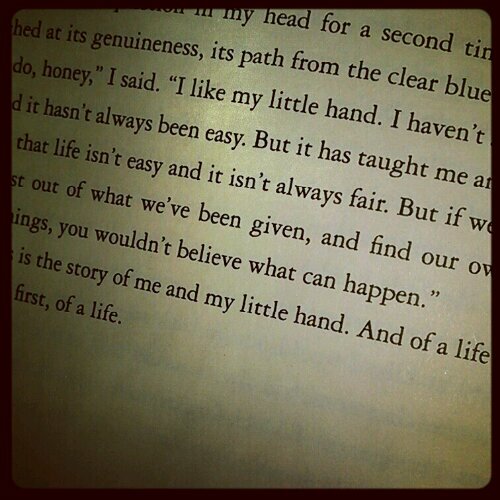 This entry was posted in Life in general, Parenting, Symbrachydactyly. Bookmark the permalink. I need a box of tissues. Can’t.stop.crying. Love that kid and LOVE you! I forget that my preggo friends have way more hormones 😉 Love you back! Seriously!!!! I am NOT a crier, and today I cannot turn off the faucet! I watched a soldier surprising his daughter on social cam this morning, and I was a WRECK! darn hormones! Thank you so much for these postings. I can’t tell you how much they are meaning to me right now. My daughter was born last night with this condition in her left hand. Suddenly discovering your new baby isn’t ‘perfect’ in some way is a hard thing, but from what I’m gathering this is more of a problem for my wife and I right now (primarily me to be honest) than it will be for her in the long run. I’m still feeling a bit angry at the universe and frustrated that I can’t just get someone to ‘make it better’, but reading this blog and some of the postings on limbdifferences.org are really helping me to find a positive perspective. Again, thank you! Thanks, Dave, for you comment – I so appreciate it and am glad you found my postings to be helpful. I sent you an email over the weekend with more thoughts, but know that we’re thinking about you from 3.5 years into this particular parenting journey.